Synthetic peptide derived from within residues 300 - 400 of Mouse Plexin A2. Our Abpromise guarantee covers the use of ab39357 in the following tested applications. WB Use a concentration of 2 µg/ml. Detects a band of approximately 230 kDa (predicted molecular weight: 212 kDa). Coreceptor for SEMA3A. Necessary for signaling by class 3 semaphorins and subsequent remodeling of the cytoskeleton. Plays a role in axon guidance, invasive growth and cell migration. Class 3 semaphorins bind to a complex composed of a neuropilin and a plexin. The plexin modulates the affinity of the complex for specific semaphorins, and its cytoplasmic domain is required for the activation of down-stream signaling events in the cytoplasm. Belongs to the plexin family. 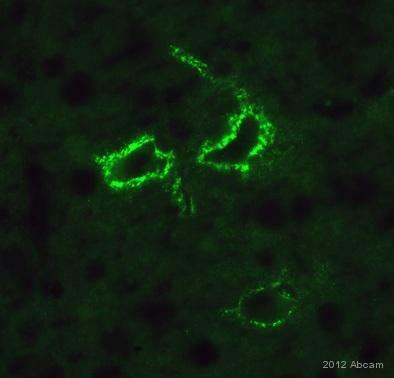 IHC-FoFr image of Plexin A2 staining on mouse cortex (Lamina V) using ab39357 (1/300). The sections used came from animals perfused fixed with Paraformaldehyde 4% with 15% of a solution of saturated picric acid, in phosphate buffer 0.1M. Following postfixation in the same fixative overnight, the brains were cryoprotected in sucrose 30% overnight. Brains were then cut using a cryostat and the immunostainings were performed using the ‘free floating’ technique. Plexin A2 contains a number of potential glycosylation sites (SwissProt) which may explain its migration at a higher molecular weight than predicted. 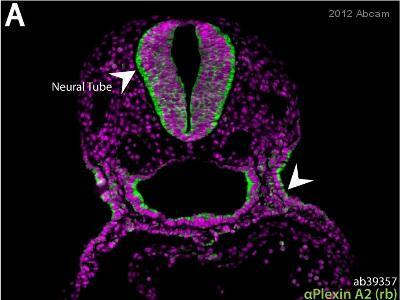 Immunofluorescence analysis of mouse neural tube cells, staining Plexin A2 (green) with ab39357. Cells were fixed before being blocked with 10% serum for 1 hour at 26°C. Samples were incubated with primary antibody (1/100 in diluent) for 12 hours at 4°C. An AlexaFluor®488-conjugated goat anti-rabbit polyclonal IgG (1/500) was used as the secondary antibody. Publishing research using ab39357? Please let us know so that we can cite the reference in this datasheet.